This is the registration page for Spring NOVA Family Camp (May 3rd-5th). For Fall NOVA Family Camp (August 16th-18th), please click here. 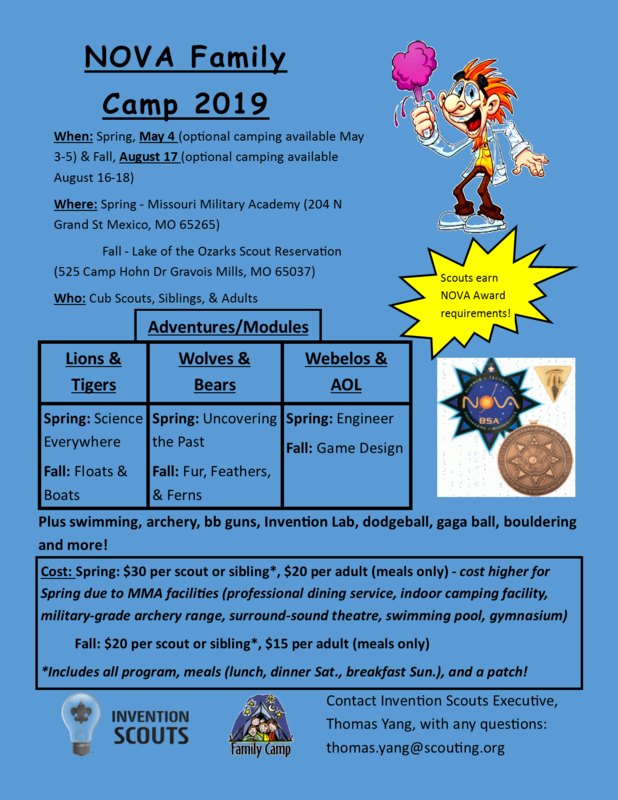 *Indoor camping available at Missouri Military Academy in field house (no staked tents allowed in field house). Outdoor camping available as well. Registrations paid online will incur a processing fee. If you would rather pay by mail, select the mailbox icon at checkout. Event coordinators reserve the right to postpone/cancel an event if registrations are insufficient to cover expenses five days prior to the event. If an event is postponed/cancelled, registrants will have the option to receive a full refund or transfer fees to a future or different event. All refund requests must be submitted to the council office within 7 days of the event (April 26th). A unit leader, Scout, or parent may request a refund of fees under the following conditions only: 1. Illness or serious accident of Scout prevents his/her attendance at the event. 2. Family illness or emergency prevents the Scout's attendance at the event. Refunds will not be given under any other circumstances. If a refund is granted, a 25% readiness fee will be withheld. However, if your unit wants your refundable fees transferred to your unit shop account, the readiness fee will be reduced to 15%.